Golden Gate Park's Music Concourse occupies the former site of the 1894 Midwinter Fair's Court of Honor. 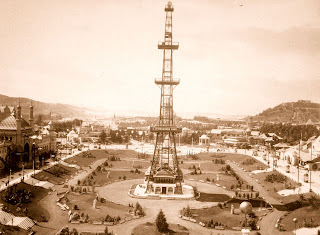 Designed as the centerpiece of the fair, the Court of Honor was surrounded by the exposition's five major structures, and contained a large sunken garden and the Bonet Electric Tower. The sunken garden was filled with lawns, interspersed with beds of flowers, as well as shrubs, palms, and many tropical plants. Seven broad concrete stairways led down into the garden, which was surrounded at the top edge by decorative concrete bollards, connected by heavy anchor-chains. After the exposition closed, the Court of Honor remained as a garden space. 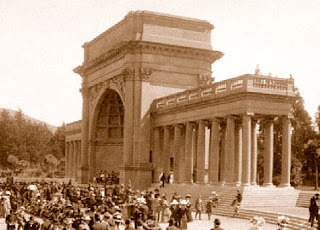 In 1900 the Spreckels Temple of Music was constructed at the West end of the garden, renamed the Music Concourse. Built of Colusa sandstone, the Temple was designed as a bandstand and outdoor concert stage combined, and contained a large platform for musicians and singers. Sycamore and Dutch elm trees, kept topped & pruned, were planted to shade the many music lovers who came to the Concourse. In 1906, the Temple of Music was severely damaged by the Great Earthquake, and had to be partially rebuilt. The Music Concourse remained mostly unchanged over the years, except for the addition of several fountains, and the removal of the chains connecting the concrete bollards. The chains were donated to the metal-drive for the war effort, during WWII. Many of the bollards were also removed over the years, as changes were made to the surrounding walkways and parking areas were added. The Temple of Music was again damaged by the Loma Prieta earthquake of 1989, and had to be repaired. By 2004, with two new museums under construction, both of which faced the Music Concourse, it was decided to perform a major restoration of the area. New landscaping was added, trees replanted, fountains restored, paving & stairways replaced, and many of the 1894 concrete bollards were reproduced, replaced, and connected with chains. 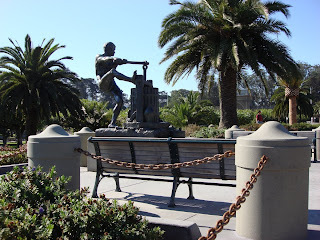 The restored Music Concourse contains features from both the past and present, and continues to be a popular gathering place for San Franciscans and visitors to Golden Gate Park.